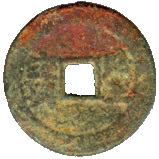 After Hung Hsiu Chuan reached Nanking (Tienching , their capital later) with his followers in 1853, Taiping Tien Kuo [The Taiping Heavenly Kingdom] began to issue coins as to consolidate their political power and cater to economic needs. They had minted plenty of coins from 1853 to 1864, lasted more than ten years. Their currencies had been circulated mainly in the provinces of Kiangsu, Chekiang, Anhwei, Fukien, Kiangsi, Hunan, Hupeh and Honan of China. 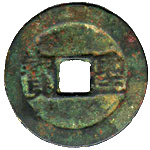 Although most of the relics of the Taiping Tien Kuo were destroyed by the Qing (Ch'ing) government after the insurrections was suppressed, some of the Taiping Tien Kuo coins had survived till this day. In the 19th year of the Chia Ch'ing reign (1814), Hung Hsiu Chuan was born in a peasant family in Kwangtung province. He began to study at 7. Hung leaved school at 16 and followed his father as a peasant. He became a village teacher at 18. During the period of his study, Hung failed in the first level of examination to get a "Hsiusai" [a low degree in imperial examination system] at less for four times. Hung Hsiu Chuan and his classmate Feng Yun Shan established Pai Shang Ti Hui (Society for the Worship of God) in the 23rd year of the Dao Kuang reign (1843). Following the Treaty of Nanking (29th August, 1842), the social and economic order of China was violently shaken. The contradictions between the poor people and the Qing government were intensified with the foreign influence. Furthermore, large areas of Kwangsi and Hunan provinces had suffered from famine for several successive years. The poor people of China had neither money nor food, it was the world of sorrow and grief to them. Hung claimed himself was the yeunger brother of Jesus Christ, he had come to earth to save minkind. You can imagine the impact was how large at that time. In July 1850, Hung's followers numbered more than 10,000. After the Opium War, insurrections took place everywhere in south parts of China. Hung perceived the rule of Qing authority was weak especially in Kwangsi province. This encouraged him to rise up and overthrow the Manchu government. On 10th day of December of the 1st year of the Hsien Feng reign (11th January, 1851, birthday of Hung Hsiu Chuan at 38), Hung proclaimed the uprising and announced the establishment of the "Taiping Tien Kuo". The Taiping rebellion took place in the Chintien village in Kwangsi province. The Taiping army moved northward through the provinces of Kwangtung, Hunan, Hupeh and Anhwei reached Nanking of Kiangsu province in the 3rd year of the Hsien Feng reign (1853). They settled in Nanking and changed her name as Tienching for their capital later. 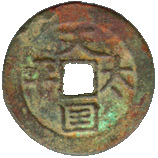 Hung Hsiu Chuan established a court on imperial lines and began to organize an administration in Tienching where he issued his currencies. The Taiping rebellion finally crumbled because of the internal conflict and weaknesses in the 3rd year of the T'ung Chih reign (1864). 張作耀 ： 中國歷史便覽，人民出版社 , 1992, (Zhong Guo Lishi Bianlan) ISBN 7-01-000308-4/k.53.